Anytime you try to cook a new kind of cuisine, I know that just reading the ingredients list can send you into a spin. And pretty often, I run into people at our local Korean market asking me about what they should buy, which brand is the best, etc. Sometimes I even offer to help before they even ask because of the lost look on their faces, staring at the soy sauce section forever, trying to figure out what they should buy. Soy Sauce: What is the difference between Korean Soy Sauce (Guk Ganjang) and Japanese Soy Sauce(WheGanjang) or just regular Soy Sauce (Ganjang)? The traditional Korean Soy Sauce for Soups (Guk Ganjang/Gook-ganjang/Guk-Kanjang) is made purely from Soy beans, water and salt. Cooked soybeans are fermented and then salt water is added. The mixture is left for 2-3 months outside in the cold winter months in Korea until the liquid becomes black. This is basically your Korean soy sauce or Guk Ganjang. The process takes few months and the taste is so complex and wonderful, there is really nothing like it. This soy sauce is lighter in color (than the Japanese, Chinese version), is saltier, but instantly elevates a Korean dish. As the name suggests, Guk-Ganjang/Gook-ganjang/Guk- Kanjang) should be used for soups, stews and to flavor various vegetable side dishes (나물 Namul). Some good Korean brands are Sempio, Pulmuone and Cheongjeongone. You can buy good quality Sempio GukGanjang from my Kimchimari online store – look under Seasonings category. The most widely used Dark Soy Sauce in the US is probably the Japanese version and is also the case in Korea. Unlike the traditional Korean soy sauce, this soy sauce was made for mass production for the Japanese soldiers during world warII. And it was introduced to Koreans and became widespread due to the lower price compared to the traditional soy sauce. It is made from soy beans, wheat, bacteria cultures and possibly other chemicals. The sauce is thicker, less saltier and somewhat sweeter, so it’s does not work well with soups. Kanjang should be used for jorims(jangjorim), meat marinades (bulgogi), stir fries, grilled dishes and for sashimi. The most common brand is Kikkoman and is good enough. My favorite brand these days is Sempio Organic Naturally Brewed Kanjang. But other soy sauce that Sempio produces are just as good tasting soy sauce. Just don’t buy their JinGanjang(진간장) if you can help it. Sempio is the oldest Korean manufacturer of Ganjang. For more in-depth post about Soy Sauce – click here. Salt: Why are there so many different types and what type should I use for Korean cooking? The other more common type of salt that can be used for everyday cooking is kkot-soh-geum (꽃소금). This is a blend of 80% imported salt and 20% cheonilyeom which means it’s saltier than 100% cheonilyeom and also has much lower level of minerals since the imported salt tend to have very little minerals. Use this sparingly. 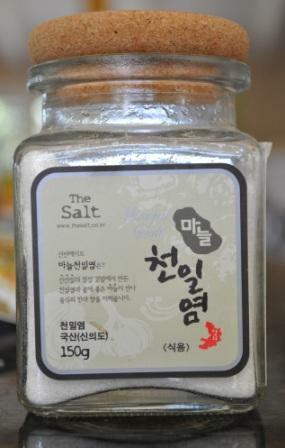 Recently, a more concentrated table salt called jeong-jae-yeom (정제염) was made by chemically isolating the salt from sea water. This type of salt can be produced very quickly and cheaply but the process also strips the salt of its natural minerals and it’s unique taste of the sea. The salinity is also 99% which means it’s lot saltier so just avoid this if you can. There are so many other salts that I cannot list them here but I do want to comment about mat-soh-geum(맛소금). This is salt and MSG blended in 9:1 ratio. Since I do not like MSG at all in my food, I don’t even think about using this in my food. But restaurants and manufacturers use this a lot in jjigae, namool and in roasted laver so just be mindful of that. Coarse Korean red chili powder (Gulkeun Gochukaru 굵은 고추가루) is what is used the most in Korean cooking these days and over 90% of Gochukaru sold at markets are probably coarse. Traditionally coarse red chili powder was used in making all kinds of Kimchi except for water Kimchi (mul kimchi 물김치). Coarse gochukaru gives you brighter red color, gives you a more clean flavor with even a bit of a zing. It is also used to make jjigae, guk and namul. Fine Korean red chili powder (Goun Gochukaru 고운 고추가루) is definitely needed in making gochujang and then for mul kimchi. Also used to make refined sauces and sometimes used for moosaengche when you don’t want to see the little chili flakes. Fine gochukaru produces less clean almost kind of a muddy taste and thus not usually used for fresh vegetables. But for stews and soups that is what you may want. Traditional Korean chefs use a combination of both fine and coarse in jjigae and soups but if you are not a serious cook or if you are not making gochujang or mul kimchi, chances are you probably won’t need the fine gochukaru. Buy fine gochukaru ONLY if you are going to make gochujang or if you want to make pretty sauces. 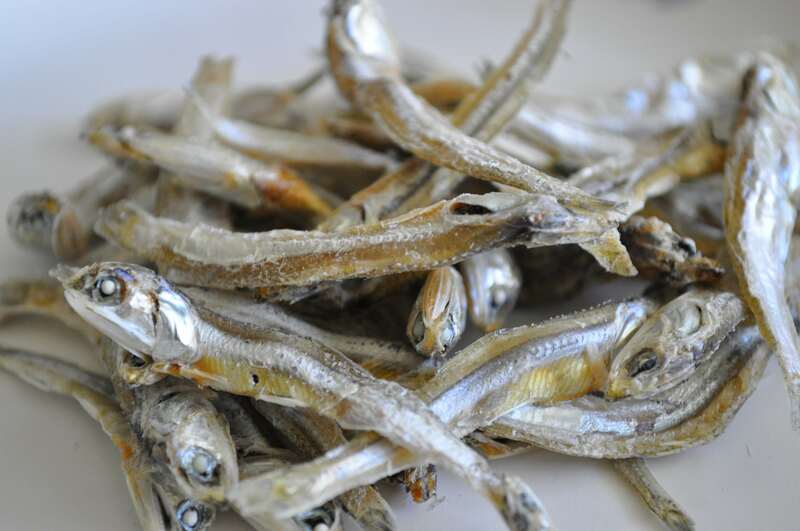 How to choose good quality dried anchovies for anchovy stock? 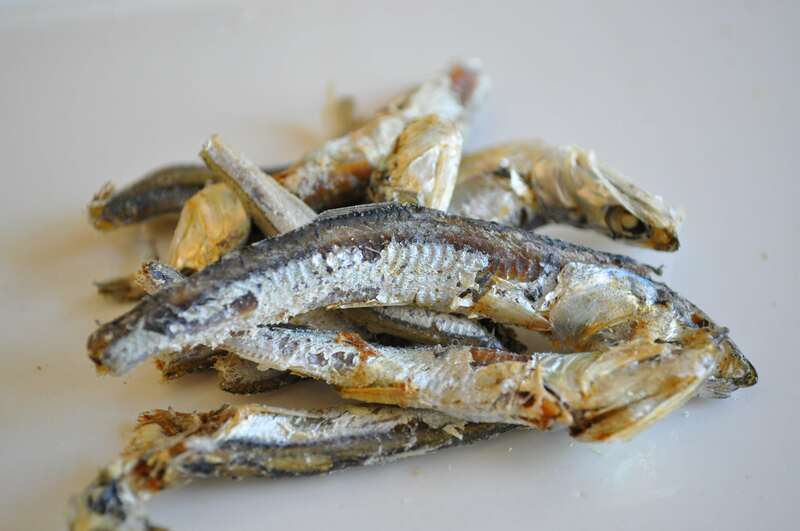 What kind/size of dried anchovies should I use for making stock? Both of these anchovies will work great for making anchovy stock. The one on the left is purely for stocks and really does produce the best stock. Note the meatiness of the fish and the silvery shine. It should still a bit moist and not totally dry. The one on the right is smaller and may not be as fabulous as the ones on the left for making stock but it is still good enough. These smaller anchovies can also be used to make myulchi bokkeum (멸치볶음) or pan fried anchovies when you take the head off and the innards out. That’s why I like this size because it can be used 2 different ways. Another way to tell a good quality anchovy is to taste it just as it is. It should still be chewy (which means it’s still moist and not too dry/old) , meaty and taste good by itself. Make sure you take the innards out when you taste it because the innards leave a bitter taste. This applies to bigger anchovies only. You can eat the smaller ones whole with the head and the innards without getting the bitter taste because the innards are so small. I wish I came upon this blog sooner! I have been asking my family and friends all these years to explain all these little differences. Your post on the different types of doenjang and soy sauce was just as illuminating! Thank you! Hi Linda, wow – thank you soo much for appreciating the work that I do!! It’s truly rewarding to hear that it helped to answer your questions. I hope you can share them with more of your friends. Cheers!! HI there, I live in a small town in OH and the closest Korean grocer is two hours away and it is a small store at that. 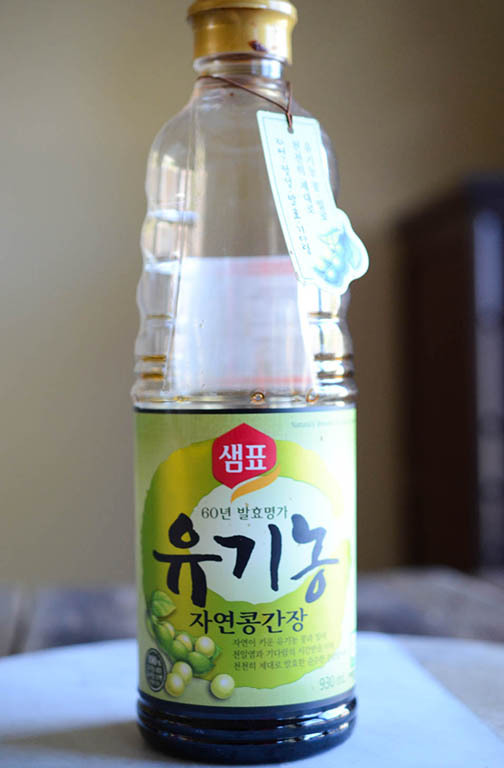 Do you know any good online stores that sell Korean ingredients? I personally have not done any online ordering but I think hmart.com should be a good one since I have visited their stores in VA and they are pretty good. the website says they deliver to all 48 states. I was in the Korean store the other day and there were two different types of Ssam Jang there. I couldnt really tell the difference other than the name of it on the packaging. Not sure if you know what Im talking about or know what major differences there are when it comes to that. I am guessing you are referring to just regular ssam jang and ssam jang made for meats(고기용 gogiyong). The exact make up will vary based on the brand but the one made for meats will usually have more garlic/onions and even some yellow mustard extract. Since you are using it for rice cakes, I would assume that the regular would probably work better unless you want your dish to be extra pungent. 🙂 Good luck! Let me know if you have more questions.